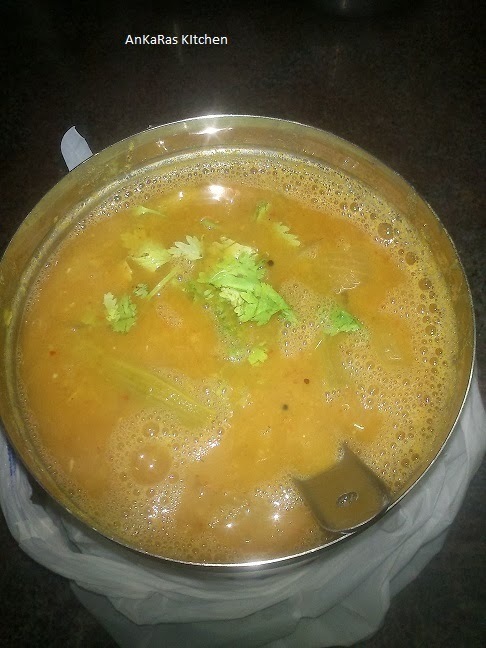 It is the traditional Idly sambar which my amma makes.The sambar is special for only Idlies & Dosas.It is different from the usual sambar that we made for the rice.We use both thoor dal moong dal.When my mom make this sambar I eat in tons of idlies dosa the Idly Dosas are also hot.So,I am sharing this to you also. 1. In a pressure pan fry the moong dal for 6-7 mts. 2. Add the thoor dal,vegetables,chopped tomato,chopped onion,green chillies. 3. Pressure them till 2 whistle.Then,open the pan & add coriander powder,chilli powder,turmeric powder,salt & cook for 5 mts. 4. Now,in a tempering vessel pre-heat the oil & splutter the mustard seeds,urad dal,curry leaves. 5. Add the onion & fry the till gloden brown & add to the sambar. 6. Sambar is ready serve with Idly & Dosa.